On Sunday, I found Strip the Turken lacerated all the way to the muscle. 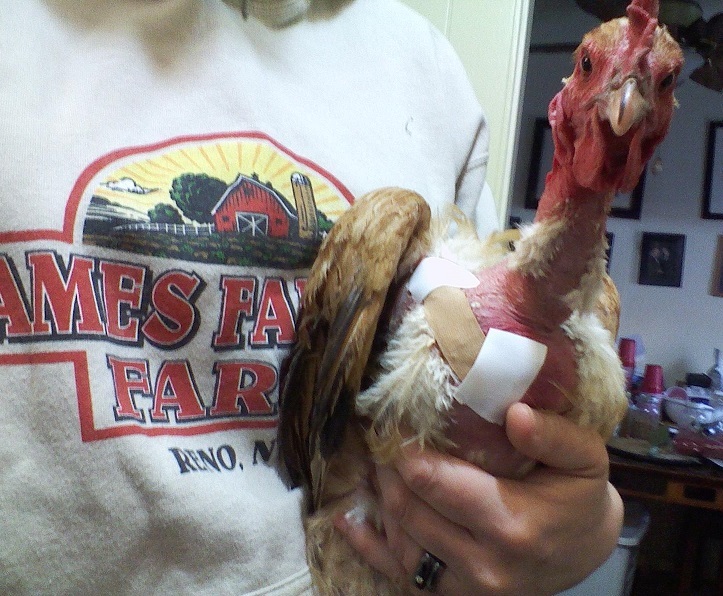 I promptly brought her inside to suture, but by the time I locked the poultry up at 9pm, the wound had opened. After suturing her again, we lined a small box with a towel, and rested it in the bottom of my dark bedroom closet. For three days, Strip was referred to as “Closet Chicken,” coming out several times a day to eat, drink, and receive first aid. I’d walk into my room, singing, and Closet Chicken warbled back from behind the doors. Today, she walked out into the backyard again. Strip still wears her Band-Aid, but she eats and drinks with her playmates again. Now I just have to clean off my husband’s shoes.